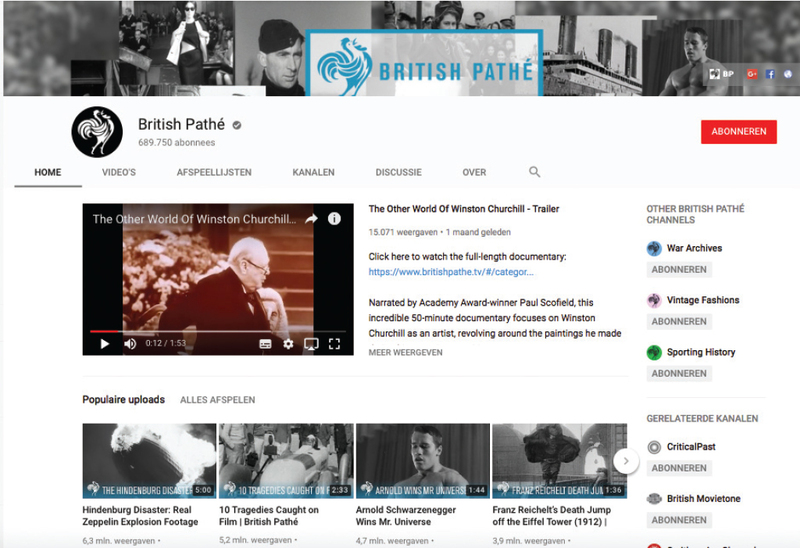 In 2014, British Pathé launched its YouTube channel with more than 85,000 items of audiovisualheritage from the 20th century. This article analyses the curational strategies of this channel as developed bythe German multi-channel network Mediakraft in consideration of YouTube’s algorithms and supposed userexpectations. This article argues that, in the context of YouTube’s commercial ecosystem, Mediakraft’scuration emphasizes celebrities, spectacular historical events, and curiosities to attract users online. De Leeuw added – back in 2012 referring to public initiatives and platforms such as Europeana, Video Active, EUscreen and Open Images – that “[t]hese developments have just started; but once realized will support the necessary transition from inward to outward service, from curators to users.” Only six years later, audiovisual heritage, it seems, is available all over the Internet, including on the popular commercial platforms Facebook and YouTube. These platforms have, as well, invested in ‘conceptual thinking’ and ‘medium specific curational approaches’ to foster user engagement.’ However, within the commercial ecosystems of the Internet, curational strategies seem to privilege more traditional content- and programme-led forms for navigation. In the following, I review one prominent example of this new ecosystem: British Pathé’s YouTube channel with its over 85,000 invaluable heritage items made accessible at once in April 2014.2 While British Pathé’s YouTube channel is – next to British Pathé’s professional platform, its subscription channel British Pathé TV, its Social Media outlets, and its other channels on YouTube, such as The Great War – only part of the whole British Pathé ecosystem online, I will here focus on British Pathé’s YouTube channel and will discuss, next to the home page of the channel, only two thematic sections as cases for further discussion. Choosing only two cases implies that this review will only touch upon surface of the whole construct, or, rather, the tip of the iceberg, of this rather complex channel with more than 85,000 heritage items and their incomprehensible links to other items, channels, social media platforms, playlists and other forms of re-use and re-circulation. However, these two cases will illustrate the curational strategies for heritage material developed by Mediakraft Networks for British Pathé given the constraints of YouTube’s commercial algorithmic culture. Crow’s choice of four films from BP’s YouTube channel to illustrate such ephemeral aspects coming alive with historical footage showcase what could be labelled as ‘attractions’ and ‘curiosities’: footage of touristic sights and technological innovations in Virginia 1967; a film showing an Amphibious Water Scooter cruising on the river Thames in front of the Houses of Parliament in London; a clip with the title Bess Truman Tries to Smash a Champagne Bottle filmed at a ceremony to launch new bombers (with Bess not succeeding in smashing that bottle on one of the bombers – haha! ); and, finally, the coverage of an Unusual Wedding of a three-foot-tall man and a six- foot-tall woman on a beach in Miami.8 Ephemera and curiosities refreshing our memories of past everyday cultures – would that be the essence of audiovisual heritage shared online? In the following sections, I wish to discuss the channel’s curatorial strategies for its unique archival footage on YouTube. I take here for granted what John Ellis11 and Pelle Snickars12 and others have contained regarding the nature of heritage material online: once digitized and shared online, the object has not only changed its material identity, but is also subject to varying contextual meanings, created by curation, user interpretation, and the commercial and algorithmic logics of online platforms. What I will focus on here are the curatorial strategies of BP’s YouTube channel as a commercial endeavour in the context of visions of participatory cultures13 and the emergence of the “dynarchive.”14 Or, as Sonja de Leeuw has suggested in her article, the increasing accessibility of audiovisual heritage online “will support the necessary transition from inward to outward service, from curators to users.”15 However, what needs to be considered in this context are the particular layers that mediate between the online archive and their users, namely business models and the algorithms shaping curational strategies of online archives. By that time, YouTube had started offering premium content partnership programming for companies and popular YouTubers promoting their content on its platform and sharing advertising revenues with them. However, since the logic of today’s commercialized YouTube resembles that of traditional commercial television,24 it needs quite some expertise to build a commercially successful YouTube channel. Therefore, BP commissioned the leading Germany-based multi-channel network company Mediakraft Networks to build and curate BP’s channel. YouTube fosters these multi-channel networks on its platform, helping to generate unique and attractive content and a significant and predictable viewership. A multichannel network offers various services to YouTubers including the enhancement of a channel’s viewership, the marketing of the channel, and support in channel, community, and social media management. A network also manages contracts with the advertising industry and functions as a mediator between content producers and YouTube.27 As Gugel reports, YouTube guaranties networks access to YouTube’s content-ID and management systems, which allows the network to administer all copyright questions and assets related to its partner’s content. Advertising revenues are shared between YouTube and the network: 45% go to YouTube, and the remaining 55% are distributed between network (16.5%) and YouTuber or channel (38.5%).28 YouTube makes individual deals with multi-channel networks, and their channels are privileged by YouTube’s algorithm once they generate marketable communities and a significant viewership for their channels and videos. Figure 1. Screenshot of the homepage of British Pathé’s YouTube Channel, March 2018. A closer look at BP’s YouTube channel, as it is curated in early 2018,30 illustrates Mediakraft’s strategies to ‘attract a global audience’ and engage it in re-using audiovisual heritage online. I will focus here on just the homepage of British Pathé’s YouTube channel and discuss only two of BP’s topical suggestions as illustrations of that strategy, while I will address what David Beer has called the “technological unconscious”31 of participatory web cultures only on the surface of the curational strategies that assume a certain understanding of YouTube’s undisclosed proprietary algorithms. On the channel’s landing page, a static banner displays diverse stills of well-known historical moments and prominent public personalities, such as Queen Elisabeth and Winston Churchill, as well as stars from the popular culture, such as Elvis and Arnold Schwarzenegger. Under the standard menu bar, with links to ‘home,’ ‘video.’ ‘playlists.’ ‘channels,’ ‘discussion,’ ‘about,’ and a search function, the channel features changing videos, which, in the first week of March 2018, was the trailer for the documentary The Other World of Winston Churchill, available on BP TV by subscription. When the ‘auto-play’ function is switched on, two other videos from BP’s archive play, both featuring, again, during this week, Winston Churchill. The homepage features in the right margin three specific BP channels dedicated to generally attractive content: War Archives with 82,786 channel subscribers, and Vintage Fashion and Sporting History with, respectively, 50,080 and 15,715 subscribers, while the main channel has about 690,000 subscribers (March 8th, 2018). Furthermore, the landing page promotes videos with thumbnails and catchy titles under diverse categories, such as ‘Popular uploads,’ ‘YouTube Series British Pathé,’ ‘Themed Months collection British Pathé,’ ‘How we made the news,’ ‘Work we’ve been involved with,’ and, again, topics related to Word War II, the British Royal Family, catastrophes, and vintage curiosities. The category ‘Popular uploads’ features the most-watched videos, among others it contains coverage of The Hindenburg Disaster (6.3 million views), a video compiled particularly for this channel with the title 10 Tragedies Caught on Film (5.2 million views), and the short clip Arnold Schwarzenegger Wins Mr. Universe Bodybuilding (4.7 million views). The chosen thumbnails of the videos support the focus on canonical historical events, celebrities, catastrophes, and curiosities, as the screenshot above illustrates. Other categories, for example, the ‘YouTube Series’ or the ‘Themed Months collection,’ which I would like to discuss here in more detail as illustrations of the curational strategies, feature less popular videos. However, most of these are, again, compilations produced particularly for BP’s YouTube channel covering historical events, celebrities, catastrophes, and curiosities. For example, the series “Archives Picks” with, in total, 29 videos, are montages of newsreel footage of 5 to 10 seconds in length picked from consecutive days of a month, but from different years. This series explicitly offers ‘appetizers’ to journalists and wishes to motivate them to cover the selected events in their news reports using the archival material. For example, the episode for 12–30 April 2017 covers ten historical events, again including catastrophes, war history, sport events, and politics. Once in a while, a banner in the upper right corner prompts the user to request a license for the material, and, at the end, the user is advised to follow the ‘links below’ to the original footage. While the commentary is taken from the original newsreels, the footage is presented with overlay titles indicating the date and event in question. Figure 2. 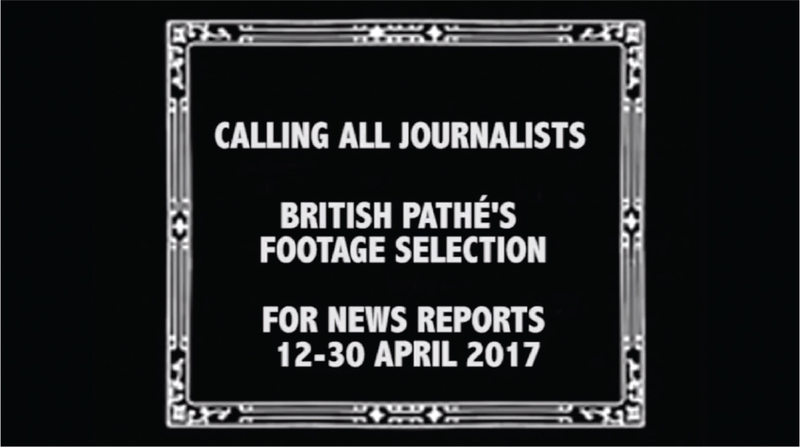 British Pathé’s YouTube Series, episode 9, compiling British Pathé’s newsreel covering events between 12 and 30 April in diverse years. Figure 3. Screenshots from British Pathé’s “YouTube Series,” episode 9: April 12th to April 30th. Figure 4. 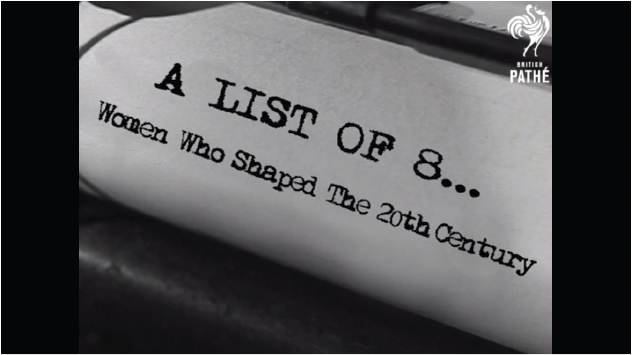 British Pathé’s compilation for its YouTube Channel: “8 Women Who Shaped the 20th Century”. Figure 5. 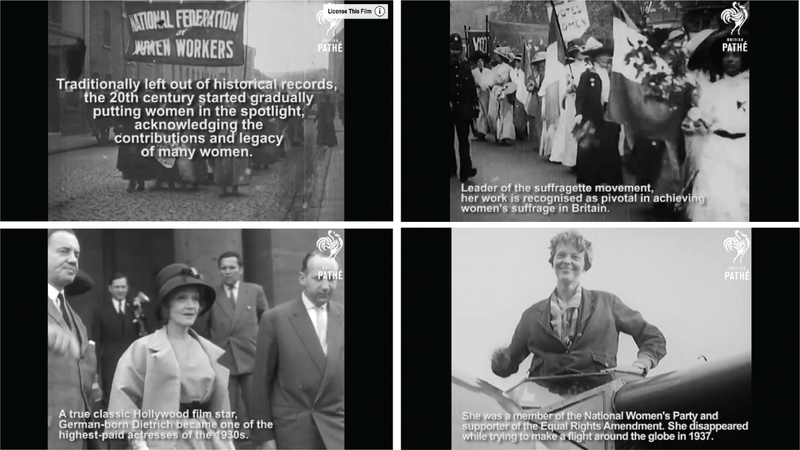 Screenshots of British Pathé’s compilation “8 Women Who Shaped the 20th Century” with the title, Emmeline Pankhurst, Marlene Dietrich, and Amelia Earhart being covered next to Constance Markie, Eleanor Roosevelt, Queen Elisabeth, Eva Perón, and Ella Fitzgerald. The following five videos in this category are, again, as their titles indicate, mostly compilations: “8 Women Who Shaped the 20th Century,” “The Emancipation of Women,” “6 Women Who Defy All Clichés,” “Woman at War,” and “A Woman’s World.” However, after one year on YouTube, these six compilations with a total length of 1:18:30, appear not to have been particular successful in creating user activities. Average views are 10,685 per video (ranging from 7,249 to 17,996) with an average of 213 ‘likes,’ 26 ‘dislikes,’ and 50 comments, which is not much compared to the above-mentioned popular and highly featured clips on the channel. Yet, without access to any documentation of BP’s targets and detailed information about views and the watch time of this and comparable heritage material on YouTube, these figures cannot be adequately be qualified. The ‘YouTube Series’ and the ‘Themed Months collection’ are just two examples that may illustrate Mediakraft’s curational strategies, described here with an eye on how BP’s archival material is presented to create a notable viewership and significant user activities related to the content. Central to this strategy are catchy titles added to the videos with a preference for compilations that assemble varied footage cut at a quick pace. The selection of the footage focuses on celebrities from political and cultural life, well-known historical events, and, particularly, catastrophes and curiosities. The topics of the compilations speak to the actuality of, or are chosen according to an imagined ‘relevance’ for, a target audience, which is important for distribution on social media and via a mailing list, which includes links to teasers for the promotion of the archival collection on BP’s YouTube channel. However, the workings and effect of YouTube’s recommendation algorithm might be different for other areas of search and exchange,34 and may, beyond that, also depend on users’ accumulated activities shaping the algorithm’s function. Rieder et al. therefore characterise YouTube’s ranking algorithm as “an intricate mesh of mutually constitutive agencies that frustrate our desire for causal explanation.”35 An exploration of how YouTube’s algorithms interactively shape and are shaped by users of BP’s YouTube channel would be a complex research project, in and of itself. Beyond that, the algorithms keep evolving and have been updated several times since the launch BP’s YouTube channel.36 Therefore, for the purpose of my discussion on the curational strategies of BP’s YouTube channel, I draw here on Mediakraft’s own understanding of the algorithms, as far as the company discloses their effects on its online tutorials for YouTubers.37 Even if this understanding of YouTube’s algorithms might be partial, it still shapes the strategies and material activities of YouTubers, including, as it seems, Mediakraft Network’s curation of BP’s YouTube Channel. YouTube’s transformation from an open video repository to a layered commercialized platform for channeled video streaming, or, as Ramon Lobato has called it, to a “hybrid cultural-commercial space,”41 has been discussed by many commentators in the past years, emphasizing the role of multi- channel networks.42 As the case of BPs YouTube channel shows, archival heritage footage is used as bait to attract YouTube users. The archival material, in its original context made for newsreels, was created for large audiences with an accessible dramatic or entertaining narrative form. However, within the ecology of online streaming and sharing, the curational measurements of a multi-channel network under the regime of YouTube’s algorithm create an extra layer of attractiveness according to the techno-cultural logics of this particular context. Different from the curational strategies of public archives and repositories, such as EUscreen.eu or Europe’s Digital Platform for Cultural Heritage, Europeana.eu, BP has, as the copyright owner of the archival material, the liberty of transforming the material to meet the supposed needs of a commercial platform and its users, while public archives and initiatives follow strictly their public service obligation as custodians of cultural heritage within the restrictions of the particularly complicated copyright regulations for audiovisual material. In the context of public institutions and initiatives, a more conservative approach to preserving and presenting audiovisual heritage online still prevails, while, within a commercial context, as I have shown, a different set of values and constraints shape the curational approach. Different to ‘the good old times’ of analogue mass media, the technological layer shaping the interaction between the cultural industry and the audience or users in a digital media ecology, adds a new layer, a dynamic of its own, shaped by both, curational practices and users activities. Here, I have only discussed Mediakraft Networks’ strategies, while a comprehensive analysis of BP’s archive online would have to take into account the whole ecosystem of platforms involved: BP’s professional site; BP’s YouTube Channels; BP’s subscription channel; BP TV; plus all of BP’s social media sites and blogs. Beyond this, all forms of appropriation and reuse, such as clicking, disliking, commenting, play-listing, linking, embedding, and downloading, re-mixing and recirculating the material would have be scrutinized in their interaction with the platforms, since the most urgent question in the context of - to say it once again with Sonja de Leeuw’s words - “the necessary transition from inward to outward service, from curators to users”44 is whether or not the new forms of popular circulation of audiovisual heritage do create new cultural practices of appropriation and interpretation of the audiovisual heritage in these new contexts. An interesting case not to forget would be a YouTube Channel under the title “The Great War,” in which weekly documentary compilations have been reconstructing World War One chronologically week by week since 2014, attracting even more followers than BP’s YouTube channel - the source of the archival material being BP’s archive and its curator being Mediakraft Networks. Eggo Müller is Professor of Media and Communication at the Department of Media and Culture Studies at Utrecht University, The Netherlands. He was leader of the EUscreenXL project (2013–206) and is coordinator of the EC-funded project European History Reloaded: Circulation and Appropriation of Digitized European Audiovisual Heritage. He is also involved in Utrecht University’s Future Food research hub. His teaching and recent projects address the appropriation of audiovisual heritage online, European film and television production cultures, and media as food intermediaries and the transition to sustainable foodways and healthy planet diets.